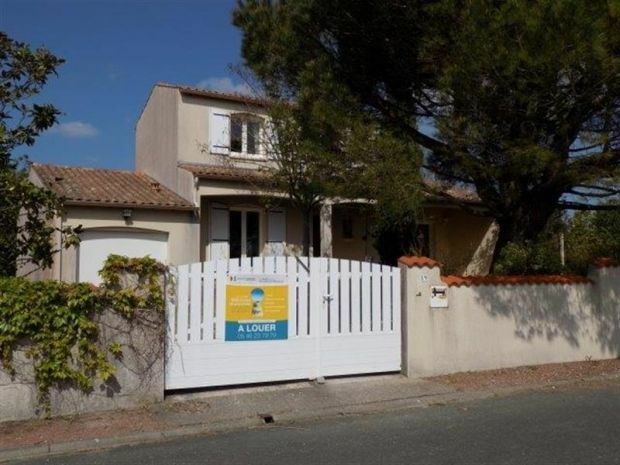 Modern style property of 93m² situated 900m from the town centre and 1300m from the beach of St Palais. Hallway. Living room opening onto the terrace and garden (flat-screen TV). Kitchen (Hob with 3 gas burners + 1 electric ring, extractor, oven, microwave, fridge-freezer, dishwasher). Bedroom 1: double with bed of 160. Bathroom. WC. UPSTAIRS: Bedroom 2: twin beds of 80 with cupboard. Bedroom 3: Twin beds of 80 with drawers. Shower room with WC. OUTDOOR FURNITURE - BBQ - GARDEN- GARAGE WITH W.MACHINE. Sleeps 6. Catch the road 100m from the house to enjoy a peaceful and shady walk around the lake or just for an ideal picnic or a nap. And also a treat for anglers! You will meet various leisure facilities for young and old: outdoor sports ground, tennis, children's playground, skate park, ping-pong tables ... The Supermarket is just 10 minutes walk and the market of Saint Palais sur Mer is 900m walk, the Beach Office 1.4 km walk (barely 20min). The 18-hole Royan Golf Course is 1.4 km away.